Over the years I’ve used the “bootlace” configuration to teach a variety of different handling skills. I reckon that a complete handling seminar could be accomplished using only four jumps and a couple pipe tunnels. Today I need to talk about the Front Cross. I’ve spent the week in a series of private lessons with a young lady and her Dachshund. And some of these notes come right out of our discussions. The biggest problem with handling is that the human part of the team approaches the task as a problem of control or manipulation or generally fussing and waving arms over the dog’s head. A lot of the artifices that result have little benefit in directing the dog or giving the dog timely information. I always begin any exercise with what I call the “entertainment round”… in which the handler might solve a simple riddle with the handling of his own choosing. 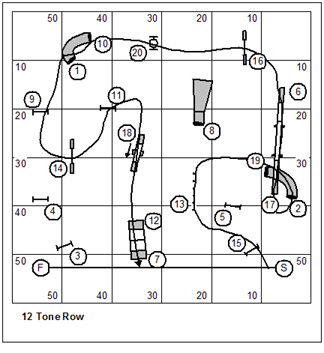 You’d be amazed how many handlers will approach this sequence managing to put Rear Crosses at jumps #3 and #6. But that’s another story. So, I’ll specify handling. 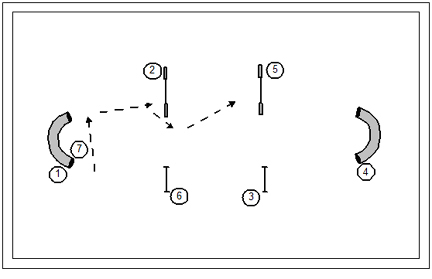 We’d like to use this sequence to practice a Front Cross. That’s not to say that the Front Cross is the only answer or even the best. We just want to practice a Front Cross. If the handler is accustomed to “fussing” to direct the dog, you’ll often get to see the wobbly path. Note that the handler after sticking the dog into the pipe tunnel goes to the exit of the pipe tunnel (as though there’s something useful to be done there); then goes to hang his feet under the wing of the jump; then has to step sideways to get around the jump; and finally moves to where he should have been heading in the first place. It’s a wonder that the dog ever gets to jump #2. And sometimes, he doesn’t. The dog tends to move in a path parallel to the handler’s path. So from the entry of the pipe tunnel the handler can turn around and make a bee-line approach to his downfield station. Note how the handler’s path gives good parallel information and even applies slight pressure back through jump #2. 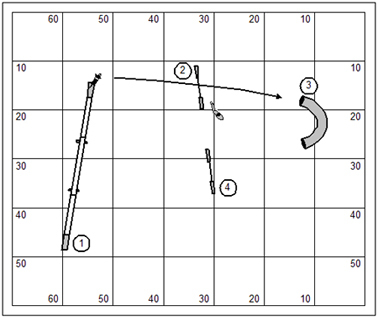 The savvy handler will understand that he really has to get on the other side of the dog’s implicit path in the transition between jumps #2 and #3. If the station for his Cross is on the wrong side of the dog’s path, then the dog’s path will be a big sloppy serpentine thing. 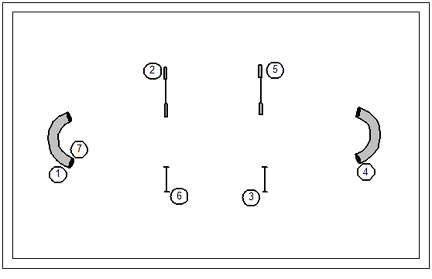 Note two spots on the course labeled X1 and X2. 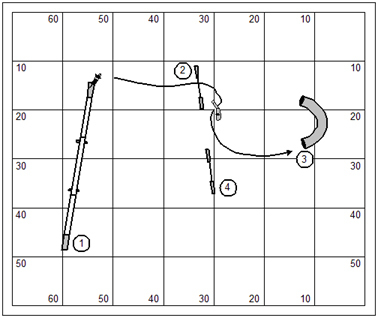 What the handler is looking for is a place to begin his Cross (X1) that lines up neatly in a path parallel to the dogs, and allows him to slide neatly between the jumps. X2 is a point of focus only that allows the handler to create a straight line in his movement. 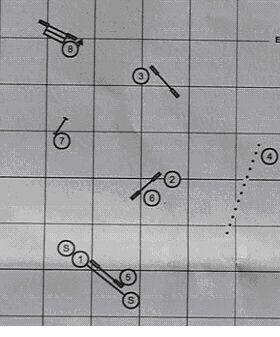 However, a point I often make is that the handler should continue moving to X2 until the dog is over the jump (#3). This means that the handler continues to support the dog in motion through the jump. Too many handlers will hit jump #3 as though there were a brick wall there. And I was very particular with the builders of my training building on this point… no brick walls on the training floor! One last point here… and it’s a matter of timing. The dog turns when the handler turns. And so when the dog gets up in the air over jump #2 the handler should be at X1 and promptly get the Cross done and get in motion down his lane. 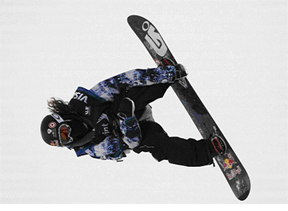 While the Front Cross is one of the most common movements in our sport… it is also one of the most flawed. I’ve documented 8 different kinds of Front Crosses, each with different mechanics and with different attributes. Actually, there are more than 8… but only 8 useful ones. The one I show here is common, but not very useful. I call it the Confront & Confound Front Cross. Note that the handler at the moment of the Cross swings up with the outside shoulder, steps in towards the dog, and hammers up his counter-arm, facing the dog in a posture that means “stop” or “go slow”. Everything is wrong about this movement. The Front Cross can be a sublime and elegant movement. The pressure should be against the handler’s inside shoulder. The handler pulls the dog into the turn, putting all pressure in the new direction of the course. While the rotation might be towards the dog the handler should slip through it neatly so that the dog has no sense of being confronted or “faced” whatever. Everything else is pulling away from the dog; the step, the shoulder, the focus. Teaching is a game of repetition. Just keep saying it until they get it. And when they do get it, somebody else will come along who needs to hear the same thing. If someone were to use the word “scoun” to call me a moron, what language would they be speaking? Note that this is a phonetic spelling. I don’t know how the word is actually spelled. And this too, is a serpentine. Note that it suggests, and probably even requires a series of side changes. And there are certain serpentines that are so subtly presented that too few handler’s even see the serpentine nature of the equipment. I want to approach this sequence with the proposition that I can outrun my dog. I can’t actually outrun all of my dogs, and that’s for sure. But if I can, I can actually use the serpentine to give my dog a speed cue from which he’ll move at his very best speed and in an efficient enough path that he’ll outrun dogs that might actually be faster. 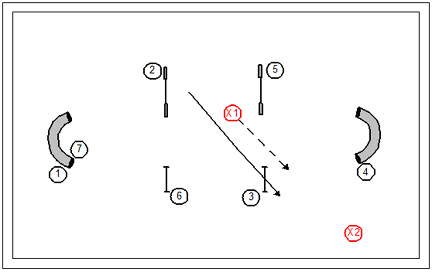 I’m going to solve the sequence with a series of Blind Crosses. What’s important to understand about the Blind Cross is that it’s a racing movement. The handler must be forward of the dog for it to work effectively. If the dog has come up on the handler’s hip the handler might be able to save the turn with the counter rotation of a Front Cross. But for the dog that has come even with the handler the Blind Cross is too weak of a turning cue. Ideally the handler will be 6′ or 8′ forward of the dog at the moment of the Cross. In this drawing I’ve also taken pains to show that the handler needs to cross the dog’s consequential path before actually committing to the Blind. If, for example, the red handler is on the wrong side of the red line when committing to the Blind, then it may not go very well at all. The handler’s path shouldn’t really wobble all over the place. 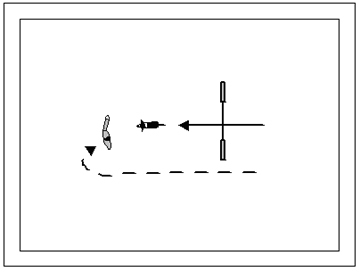 The handler has committed to a lane in each instant that allows him to continue motion in a nice straight line that strikes a path parallel and coinciding with the dog’s approach to the next obstacle. Aside from the handler endeavoring to understand where are his own corners and on what lines his path will be drawn… he should also understand the proper timing cue for the Cross. “Dog in the air… do the Cross.” A handler who understands the physical cues for his movements will achieve spot on timing. 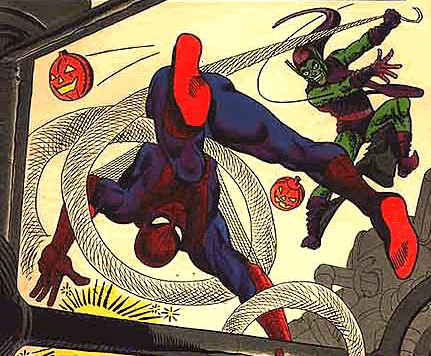 Who was the artist who created this comic book cover art? I wrote in my blog something over a year ago (Actualizing the Psychotic Vision ~ http://wp.me/pmSZZ-al) that the Ripsaw Effect is a structure in a course design in which “the pipe tunnel is firing the dog a direction that crosses the handler’s probable path”. The remarkable thing about this configuration is how many handlers will cross into the exit path and risk collision with their dogs. When I’m reviewing courses (for the TDAA) and I note the ripsaw I’ll gently suggest to the designer that the riddle should not be whether the handler can do a thing without injuring his dog. However, I don’t review courses for all agility organizations; and so I will approach this problem as a matter of teaching. It may be I should teach my students how to do this… without injuring their dogs. The handler should move near the exit of the pipe tunnel, taking care not to let the dog see him come to a stop while involved in the performance of the tunnel. As the dog makes his exit the handler will usher him past (or allow him to pass) and then step behind. This movement, by the way, is a technical Tandem; a cross behind the dog on the dismount of an obstacle rather than a hurdle. When crossing behind a dog on the dismount of any hurdle the handler can neatly step into the dog’s jumping arc. But coming off a contact obstacle, out of the weave poles, or out of a tunnel all four of the dogs paws are on the ground. And those paws need to move forward of the handler before the handler can actually step behind. With my own students I teach an on the flat foundation exercise for crossing behind the dog. When transferring the performance to agility in motion I might have to remind them that the mechanics of the handler conducting the dog through the turn are essentially the same mechanics of the on the flat foundation work. We lost our old girl Banner (Imagineer’s Patriot Red) a couple days ago. She had been in steep decline through the winter, almost completely blind, having great trouble breathing, and losing muscle and control in her back end. And so we made the very difficult decision to let her go. In my heart I will always remember a dog young and strong, happy and fearless, ruler of the pack. This sequence began a “nationals” course. What was the venue and year? 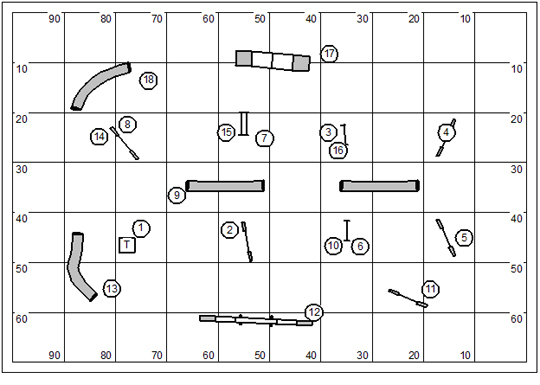 The following discussion is mostly about how the course designer creates a dog’s choice game by nesting against a standard course. This is intended for our TDAA judges’ continuing education but might be of considerable interest to the exhibitor as well (as certain secrets will be revealed). I am a stickler on nesting these days. I know that a well-nested course can save about a half an hour in course building. So if you have a day with two standard courses (for three levels) and two games (for three levels); then you can calculate the number of “half hour” drags against the day ~ (2 * 3) + (2 * 3) = 6 hours of unnecessary down/drag time. This is going to be my starting reference point… a standard course for the Superior level. This class may actually be conducted after the play of the game; and that makes no matter. The important thing is that we’re going to minimize the transition between classes no matter which we do first and which we do second. I have done some rearrangement here. I’ve taken out the table; rotated and slightly moved the A-frame; slightly moved the teeter; and added a single jump (at 50/20). It is my intention to use the A-frame as the #12 obstacle; even though the #12 obstacle is traditionally the weave poles. I’ll explain my thinking in a discussion below. I’ve also, on this course drawn what I call a “key line”. I wanted to find me a path that incorporates exactly 12 obstacles, without repeating any, in a logical flow, that ends on the A-frame as the 12th obstacle. I like to actually find the winning strategy first… and not have to agonize over it as an exhibitor might, later on. And next I should demonstrate how I know it’s going to be the winning strategy. You’ll notice that I’ve opened up the left border of the course and put a line of numbers, 1 through 20 there. And I’ve moved the #12 to the A-frame with the expectation that the dog dismounting the #12 obstacle will promptly cross the finish line. I’ve also put a gap between the #8 and the #9. Any sequence or strategy including an obstacle with a number lower just cannot be the winning strategy. Now you see that I’ve moved all of the numbers onto the field. I put all of the winning strategy numbers onto the “key line” path but randomly arranged, not in a way that would suggest the order and direction of the path. Where possible I put the number on the opposite side of the obstacle to obscure the flow. All the rest of the numbers are placed on obstacles that are not part of the “key line”. Note obstacles can be taken bi-directionally. If a number is included on both sides of the obstacle, then the value of the obstacle will depend on which direction it is taken. If the obstacle has only one number associated with it… then it has that value regardless of the direction it is taken. If we think back to the original Superior standard course, I believe at a trial I can have this game/course built very quickly. As the master course builder I’ll assign a person to pick up the old number cones; and give a different set of number cones to another person to lay down. And before old numbers can be picked up and new numbers are down… I’ll have tweaked the equipment and I’ll be calling for the exhibitor briefing. I reckon this will take me about 3 minutes tops. The purpose of 12 Tone Row is to accumulate as many points as possible. Each obstacle has the value of its number on course. Some obstacles have separate values, depending on the direction in which they are performed. The handler may direct his dog to perform the obstacles in any order he chooses (of course, if the dog chooses the obstacle to perform, the handler will have to live with it.) The dog and handler team will earn the assigned point values of the obstacles taken. No obstacle may be repeated, whether performed correctly, or faulted. Only 12 obstacles may be performed and the 12th must be the A-frame, in either direction. If the dog faults an obstacle, he will not earn the points for that obstacle. Further, the obstacle may not be repeated, and it will not be counted as one of the dog’s 12 required obstacles. If only one number is associated with an obstacle, the obstacle will earn that value no matter what direction it is performed. If the obstacle is numbered differently on both sides, then the number from the direction of approach will determine the value of that obstacle. 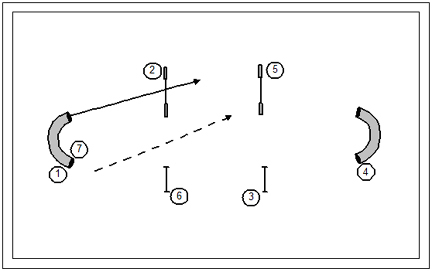 The game starts and stops with a common start & stop line at the front of the ring. Small dogs (4″ and 8″) will have 55 seconds; Big dogs (12″ and 16″) will have 50 seconds. For each obstacle more or less than the required total, the dog will be penalized 10 points. Repeating an obstacle shall be penalized 10 points and the dog will not earn the value of that obstacle a second time. I’ve made this game for “all levels”. Games that are made for all levels are the ultimate time savers. In addition to not having to tweak equipment and move numbers around, you’ve also saved yourself additional briefings for each class and in many cases, the additional walk-through. I introduced the concept of a “key line” above. I always will test a games course with two or three strategies. 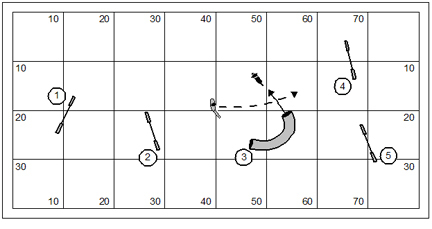 This is an important concept for the course designer. First of all, it allows me to check the interval spacing between obstacles so that those distances are consistent with TDAA standards (or the standards of whatever organization I might be designing for). I note too that the dog’s path can’t always be predictable, so I try to look at spacing in a way that I can just about ensure that the handler has adequate room to work and things are kept safe for the dog no matter what direction they might want to go. Another reason I trace out “key line” paths is that I can measure those paths to decide what kind of standard course time to set for the game. I’ll often take a reasonable strategy for a game and measure it against the SCT for that class to arrive at the QCT for the game itself. It was not necessary to trace out more than one “key line” for 12 Tone Row by the way. There can only be one top scoring path and so I only needed to draw one line. In this rendition of 12 Tone Row I used the A-frame rather than the weave poles. The original game designed by Becky Dean used a set of 12 weave poles as a serendipitous matter. Well, in the TDAA we typically use only 6 weave poles so that the obstacle has size balance or parity with the rest of the equipment. And with only 6 poles the “serendipitous” matter got a little fuzzy. Also, since the game is designed for all levels I’m painfully aware that the Beginner/GI dogs probably shouldn’t be challenged with the weave poles as qualifying criteria. 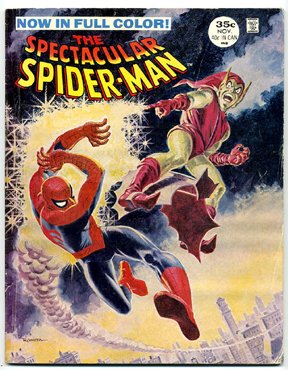 Who was the artist who did this comic cover illustration? And I had the constant observation that it had a terribly low success rate; and is as often as not used on dogs that have no need of it whatever. You’re probably wondering just what I mean by a “low success rate”. To me this is obvious. The handler is going through some pains to give the dog early information and to tell the dog that a turn is impending and the direction of the turn. It’s an obvious matter as to whether the dog understood the pre-cue. My students have given me an ample laboratory to study this sans movement. And so I have a growing repository of data. Here’s what I’ve found. A relatively small percentage of dogs understand the back-facing posture intuitively and will take the pre-cue of information. Early in my boy Kory’s training I’ve concentrated to a great extent on giving him permission to work at a distance. He will never be what you’d call a Velcro dog; that’s for sure. If there’s a downside to this training approach it is that he’s always looking forward and seeking out what’s next. So if I were to want him to wrap a jump into a tight turn (picture a Front Cross here) his turning radius will be way too big and unmanageable and frankly a terrible grind on him physically. I find myself wanting him to understand the pre-cue Front Cross both for the efficiency of the turn and to save him from trauma on his front end. If he truly understands the cue to turn he will understand collected jumping. 1. I begin with a free-shaping game in which all I want him to do is bump my hand with his nose. The command I’m using is Close. And, I’m using it like a relative directional offering the nearest hand to him. The hand is tight against my leg by facing back to him in a flat palm. 2. I move the game to the hoops. First I remind him of his obstacle focus and send him through three hoops from a mostly stationary position. And then I turn back for the pre-cue. The command sequence is “Hoop, Close!” I give both directives before he gets to the hoop. The expectation is that he will turn neat and tidy between me and the hoop as shown in the drawing. 3. I move the game to the jumps. Again, I set the pattern for obstacle focus and send him on ahead of me into the tunnel. Naturally I’m getting work on the 2o2o bottom performance while I’m on the layered side of jump #2. Finally I face back from the landing side of jump #2 for the pre-cue. The command sequence is “Jump, Close!” I give both directives before he gets to the jump. 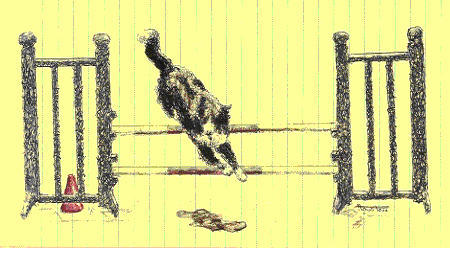 The expectation is that he will turn neat and tidy between me and the jump as shown in the drawing. I actually worked Kory today through all three steps as described above. He was about 50% in understanding the pre-cue. And just so you appreciate that statistic he was at 0% yesterday… before I did any of the foundation work. I have enough information now to be fairly sure than in about two weeks he’ll understand the cue up in the 95 to 97 percentile range which is plenty acceptable to me. Who was the actor who played the part depicted in this drawing? The group of campers I worked with this week are from the Cincinnati & northern Kentucky area who’ve been interested students for awhile. If I had a training challenge with them it was to suggest that their handling philosophy should not be more suited for young kids with long legs who run with their dogs. Indeed, there wasn’t a young long legged kid in the bunch. And so this fit neatly with the distance curriculum with which I’ve been hammering my own students all through the winter and into the spring. You know, distance skills are to a measurable extent a matter of dog training. On the other hand there is a significant handler training task as well. The handler who has been conditioned to running alongside his dog (actually training the dog to run alongside him/her) often doesn’t even know which direction to face or which direction to run when the dog is working at a distance. I tend to take the long view on these training issues. I’m pretty sure that I can teach the handler to straighten up and fly right if I were to use a shock collar as a conditioning tool (not on the dog, of course); but that wouldn’t make my students keen to want to work with me, no matter how effective the tool. At any rate I’m pretty sure I assigned everyone a bit of homework to improve their play in agility. And I’ll look forward to seeing the results of this work. You realize of course that an instructor always knows which of his students are doing their homework. As I wrapped up camp yesterday I told my campers that it was more than likely that my students would get a game based on the set of the floor just as the equipment sat as we finished. It’s been four camp weeks in a row, complete with evening classes and weekend clinics and I really wasn’t much fit or in a temperament to move equipment around. I have a person coming next week taking the “cottage package”. That means she’ll stay in one of the cabins down by the pond, and take a couple hours of privates with me each day. It is a vacation visit for her with a bit of time for her favorite hobby. I’ve plenty to do of course. This morning I’ve been working at getting my garden in. The over-night freezes are pretty much done with, so the plants I’ve been nurturing under grow lights need to get their roots into real soil. My garden is somewhat unconventional as I subscribe to the “square foot” method, packing in the plants for optimum performance and pretty much ignoring the advice on the seed packets proclaiming that simple vegetable plants need to have about 18” of elbow room from their nearest neighbors. Oh posh. Also, I’m post-hole digging at the front drive for my mailbox that was run down by some bubba with his truck on fire last week. The post-lady won’t deliver my mail if I don’t actually have a mail box. The fella that knocked it down said he’d come back up in a couple days. But it’s been over a week and I haven’t seen hide nor hair of him. Contemptible dishonesty raises my blood pressure just a tiny bit. And you might make a case that young country boys can be naturally (and contemptibly) dishonest. But let’s don’t make this a matter of cultural prejudice at all. This ain’t my first rodeo. I’ve found that city people from the corporate culture can be just as contemptibly dishonest and sometimes more slickly so. I’ve felt the sting of contemptible dishonesty over the years. You’d just think that I’d learn. Frankly, I’d rather go on trusting people and rely on the simple proposition that if somebody is bad in their dealings with me… I just won’t deal with them any more. If that makes me naive, so be it. Okay, so I’ve got to get back down and finish that post hole. I feel like the guy in the movie Armageddon who had to drill his hole on that asteroid through an iron ore plate. The spot I picked to be the new and right spot for my mailbox is on the edge of the drive that has been a crushed granite bed for the driveway for several years. I’m fairly good about getting a new load of granite every time my drive gets a bit threadbare. It makes for a bear of a post-hole digging job though. I had to get my big iron bar spud pole for pounding, crushing, and loosening the rock as I work… I hope it don’t kill me. The game Colors comes to us from Canine Performance Events (CPE). I see it from time to time in the TDAA as well. The concept seems to be that the handler has a choice of which of two or three courses he will run his dog for titling purposes. I suppose my biggest criticism of the class is that the sequence as often quite unchallenging, which suggests a bit of a low standard for qualification. 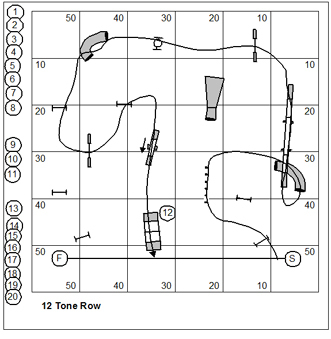 From a course designer’s point of view it probably isn’t much different from designing a pairs class or even a team relay in which there are multiple sequence options laid out on the course. Though in pairs or teams the designer has to take come care to allow for a hand-off transition between the various elements. In Colors the sequences start and stop as would a standard class. What I really wanted to do with the game is design sequences that are just a bit on the challenging side acknowledging the proposition that a true Masters handler might like the thrill of solving a significant riddle. And so I settled on a slightly different format for the rules… thus the “Country Dream” variation. Exhibitors will actually run all three courses and then throw away one of the three runs; using their best two in a Time Plus Faults format. The three sequences aren’t perfectly balanced in terms of the number of obstacles or the technical merit of the obstacles in the sequence. This isn’t really a down-side consideration. What it really means is that the handler had better try to make the simplest of the three sequence one of his “keepers”. In the conduct of the class there might be a couple different ways to do both the walkthrough and the running. For example the judge might specify that handlers will walk all three; and then as a class everyone would run A, then B, then C. However, with my own students I took pity. There is a bit of a stereo quality to the three sequences in which a handler might get his head completely turned around and lose track of which one he was working. And so we walked all three, and then ran “A”. I gave them no more than a minute to review (walk) B; and we ran that one. Then, we did the same fire drill with course “C”. It turned out to be quite a fun league play class. 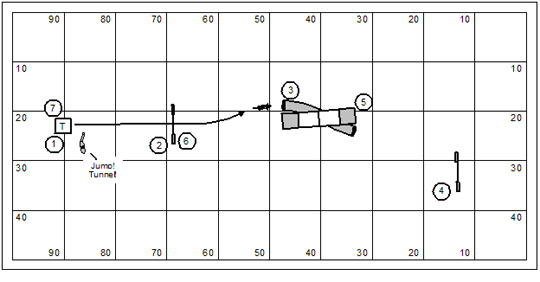 For the purpose of qualification, if that’s ever a consideration, what I would do is measure all three courses and then base SCT on 2/3 of the overall course length for the respective jump height. Scoring, as I suggested earlier, would be Time, Plus faults measured against SCT. What was the name if this animated character? Who was the film director? In and Out is the invention of Sheri Boone. This game was created to encourage handlers to think about motivation and strategy. 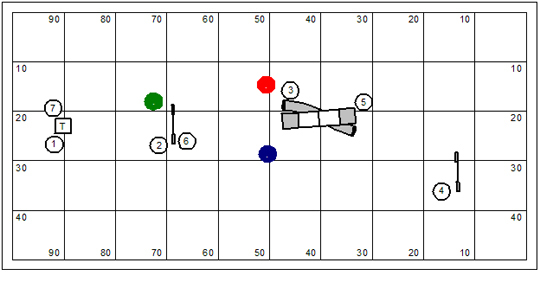 The game is considered motivating because movement and point accumulation on a course does not stop until time runs out. The game is considered strategic for the sole purpose of accumulating points in a variety of different ways. The course is divided into three different segments. The “inner” loop, the “in and out” loop and the “outer” loop. In this course the inner loop is #1-#4; the outer loop is #5-#13; and the in and out loop is #14-#19. If a fault occurs during a loop, the dog must immediately restart from the first obstacle in that loop. The loop is repeated until completed without fault. Then the dog must start the next loop. The judge will call out “fault” when a dog has faulted an obstacle. The dog is faulted for dropping a jump bar, missing a contact, or going off course. Refusals are not faulted. No points are awarded in a faulted loop (the Rukis variation). The standard course time shall be 50 seconds for big dogs, and 55 seconds for small dogs. The timekeeper will signal the end of standard course time. If the dog has not completed the course, he must be directed to the finish line to stop time. In and Out is scored points then time. The dog with the most points wins. Time is a tiebreaker only. If the dog completes the entire course before time runs out, the difference between the dog’s time and the course time becomes bonus points added to the score. All times are rounded up to the next second. It would probably be useful to redraft the provisions for faulting a loop. 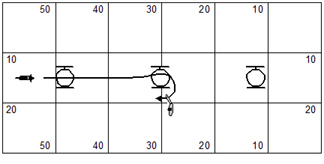 Okay, as it stands if the dog faults a loop the handler is required to direct the dog back to the start of the loop. 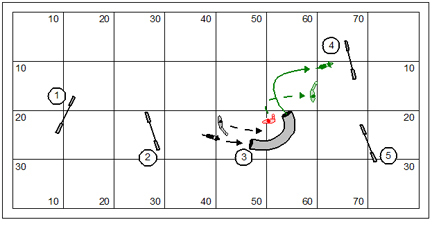 In the design I’ve drawn for this week’s game… imagine if the dog has faulted the outer loop; say, he misses the down contact of the dogwalk at #12. So he gets to rerun everything from #5 back to #12. This could really turn into a death spiral. It might be comical, amusing, fun; but there’s not much point in it. The dog is pretty much out of the running having to repeat 8 obstacles in a 19 obstacle course. Agreed? So maybe the simple thing to do is give the dog 5 faults; and then run the game as Faults, then Time. 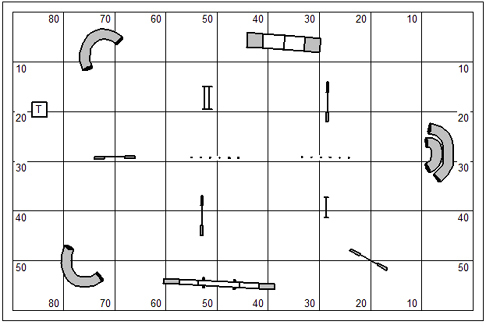 We also have in this game the issue of the judge calling out number values for obstacles performed. You recognize, of course, that this is a numbered course? There’s probably no good reason to put somebody in the middle of the course yelling numbers. As stated under the rules the dog doesn’t earn the value of obstacles in the faulted loop… eh, so this is a terrible complication for the score-keeping table. In any case when you have a judge calling out numbers for performance you’ve introduced the very real possibility of scribing errors. And the judge on the field cannot monitor or audit what the scribe writes down. I’d favor a simpler system that places dogs according to speed and accuracy of performance (not necessarily in that order). As I wrote in the Book of Agility Games… all systems of rules are irrational. Finish this phrase: “The Flying *******”. The small camps that I teach allow me to bring out my own dog, partly for the purpose of demonstration, and just as partly for the opportunity to train him a thing or two. I’ve always considered myself a lazy trainer (though completely relentless); and I manage to take the long view of the training mission. Kory keeps disappointing in this though… because he never takes the long view. He gets things so quickly that I nearly feel ripped off that I didn’t get to run my naked toes through the intricate granularity of my complete training protocol. Okay, no, I don’t really feel ripped off at all. Surprised and amazed is more the order of it. You know though, I’m more and more convinced that Border Collie training is a matter of moderate intelligence. And thank the heavens for that. I’ve always taught the handling of the traditional discrimination puzzle to be a matter of relative position to the dog. The red dot on the map above represents the body magnet position. The handler relies on the notion that the proximity of his body to the obstacle being taken is a powerful attraction to the dog, and the dog should gravitate to the obstacle nearer to the handler. Of course a savvy handler will take the insurance of an RFP to fortify his attractive position. 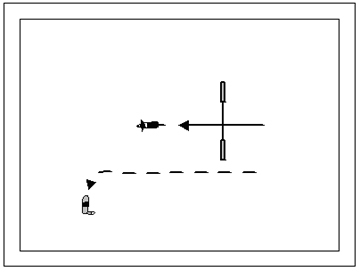 The blue dot represents the blocking position from which the handler will bend or intrude to block the approach to the wrong course obstacle, with the insurance of a Get Out. And the green position represents the behind-the-dog fast-dog-handling position, probably handled by tapping on the brakes and rolling into a Post & Tandem movement. … teach your dog the names of the obstacles. It took me about 10 minutes with Kory. Now he’s nailing this with about 99% accuracy. I stay at the table and after the initial jump command will frame my intentions forward. Oh boy. Perfect dog for an old man! I know I’m OOP for the jump after the tunnel. But I’m training my dog here. Be patient with me. Who is the dog in this drawing? Who was the handler? 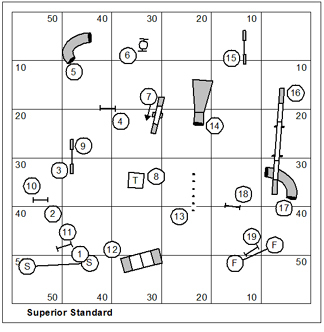 This is a standard course (follow the numbers) that can be run under whatever set of rules to which you subscribe. I was playful in the use of the pipe tunnels on this course because the course itself becomes a premise for my teaching. We do tough things in training that I probably would not do as a course designer. I’ve neglected my blog. I had camp last week, I had a mini-clinic on the weekend; and I have camp again this week. Just as these folks leave me on Thursday I have a private party arriving who’ll be with me over the weekend; and then I have another camp this week. Neglect might be the wrong word. I’m truly not being negligent. I’ve just got so much to do that I can’t keep up with it all. After camp ended last week I had a couple days in which I could have kept up with correspondence, the blog, TDAA course review and so forth. But I would up planting about three dozen trees that I dug up at the end of last Fall. I have to get them into the ground, or all I’ve wound up doing is killing a bunch of trees. And that was never my intention. 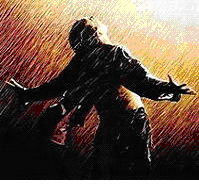 This weekend the work will be light. I’ll do two or three hours of privates each day. So I intend to use my spare time to get my garden in. I have a bunch of seedlings that I’ve been protecting in the basement… carrying them out into the sun for the day and back into the basement each evening in case of a freeze. I’m trying to give my tomatoes a bonafide head-start, basically. This weekend though I want to get in my seed potatoes, plant a heap of broccoli plants, and maybe pick up a dozen or so pepper plants of different variety. Hopefully the roto tiller is going to start right up. I didn’t drain last year’s gasoline. And gasoline is kinda like beer. It doesn’t like to sit around for a long time and will lose it’s zing for resting too long. Last week’s camp and this week’s have both been an absolute delight. Last week I had a bunch of return campers… mostly from NY state and from more local digs around Ohio. It’s fun working with continuing students because I don’t have to go down to foundation every time we get together. We can move on to strategy topics and so forth. This week is a Pyrshep camp. Yes, that’s right… they’re all Pyrsheps. I find it to be a remarkable breed with quite a bit of built-in drive and desire. A couple of these folks have trained with me before. More and more my camps have gone over to the “private” camp, which means that the attendees are self-assembled friends and acquaintance who share the camp and training experience. While it’s a bit of a vacation; they find out very quickly when training with me that it’s a bit of a working vacation. I just about never allow my students to dally in the comfort zone. Okay… I’m off to save the world. I’ll try to write more tomorrow. What is a Duncan Dogwalk? And just to give you a hint… no, it isn’t a place where police officers eat doughnuts. This game is an invention of Brenna Fender. It is intended as a game of strategy, comparable to Snooker. Pole Jacks creates an atmosphere for intensive work on the weave poles. The game requires consistent performance and pits the dog against the poles with a variety of entries and velocity of approach. Use this game in training to sharpen everyone’s weave pole work. Pole Jacks has been called Weave Pole Snooker. Pole Jacks is played like the children’s game of jacks. The performance of a short set of weave poles is the bounce of the ball. 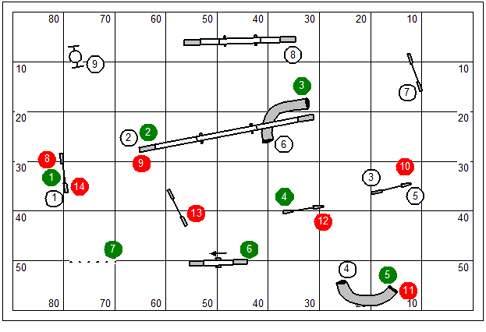 All other obstacles on the course are jacks and have specific point values. After the “bounce” (doing the weave poles), the team must “pick up” the appropriate number of jacks by scoring an equivalent number of points. The handler and dog team will bounce “onesies,” bounce “twosies,” bounce “threesies,” and so forth until either they reach bounce and “sevensies” or time expires. The dog’s time begins when he fist makes a “legal” entry into the weave poles, entering between pole #1 and pole #2 from right to left. The dog’s time ends when he gets on the table or crosses the finish line. The SCT shall be 60 seconds for big dogs and 55 seconds for small dogs. The end-of-time whistle ends scoring only; the clock continues to run until the dog crosses the finish line or goes to the table. After the time whistle, there will be no fault and no points for the dog taking additional obstacles on the way to the table or finish line to stop time. The dog must pick up points equaling the number for which the team is shooting after the bounce. For instance, if the team is shooting for 6, they could do a jump and the teeter or they could do a tunnel and the tire. No obstacle may be taken back-to-back on the same pick up. However, an obstacle may be repeated in the same pick-up. Pole Jacks is scored points then time. The dog’s score will be the number of his last complete pick-up. The winner is the dog with the highest points and with least time in the case of a tie. The maximum points that can be earned are 7. If time expires while the dog is engaged in a pick-up, the points earned are appended to the dog’s score as a decimal value. For example, if the dog has picked up 5, and has done two jumps when the time whistle blows, then his final score will be 5.2. The following discussion is intended mostly for the TDAA games designer (judge). This is a carefully considered variation of Pole Jacks. It is not scrupulously or rigorously faithful to the rules documented for the game in the Clean Run Book of Agility Games, in a couple small regards. 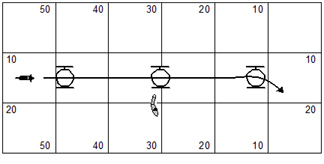 The rules as originally written specify that a single obstacle cannot be repeated during a pick-up. I’ve changed the rule for this game (this time) to allow an obstacle to be repeated; but disallow back-to-back performances. Also, I’ve changed the scoring to allow the dog to earn points for incomplete pick-up when time expires. This is a good change. What we’ve done in the past is to only allow the full-digit score for the pick-up. As a consequence a dog who might squeak by a score of 6… who happens to be near the table when the whistle blows, will place higher than a dog that scores 6 on the pick-up, and has earned another 5 or 6 towards the 7 pick-up but is farther away from the table when the whistle blows. TDAA judges are allowed to create new variations of games that we play. What I look for in a variation is that it adds interest. We shouldn’t be changing the rules just because we’re being too lazy to figure out what the rules are supposed to be. What was Stuart Mah’s occupation/job before his life went to the (agility) dogs? You are currently browsing the Bud Houston's Blog blog archives for April, 2010.